The Himalayas are arguably the world’s most iconic mountains. They gave birth to the highest point on the planet, Mount Everest, 70 million years ago. However, Everest’s famous (not to mention dangerous) mountain climbing trek isn’t your only option. The Annapurna massif contains six stunning mountain peaks– named Annapurna I, Annapurna II, Annapurna III, Annapurna IV, Gangapurna and Annapurna South. 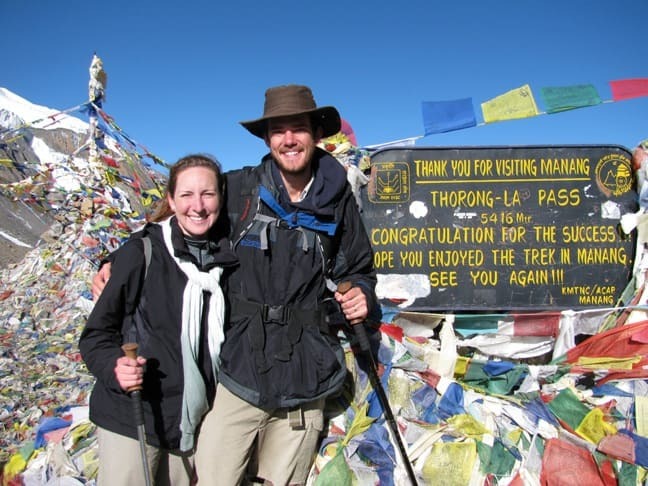 In September of 2009, my husband and I had a chance to do the entire Annapurna Circuit trek. 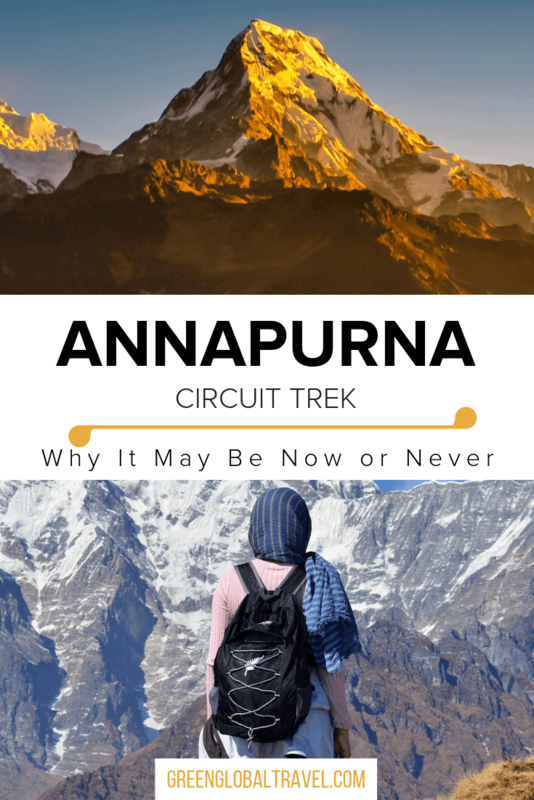 The Annapurna Circuit is a horseshoe-shaped route that covers 131 miles (211km) and can last anywhere from 16 to 21 days depending on your walking speed, acclimatization timeline and overall schedule. The trek begins in the southeastern town of Besisahar at 2,690 feet (820m) and ascends to the highest point, Thorung Pass at 17,769 feet (5,416m). It then descends to Tatopani at 3,937 feet (1,200m) and peaks again for another ascent to Poonhill at 10,499 feet (3,200m). Thereafter it’s all downhill to the final town of NayaPui at 3,510 feet (1,070m). 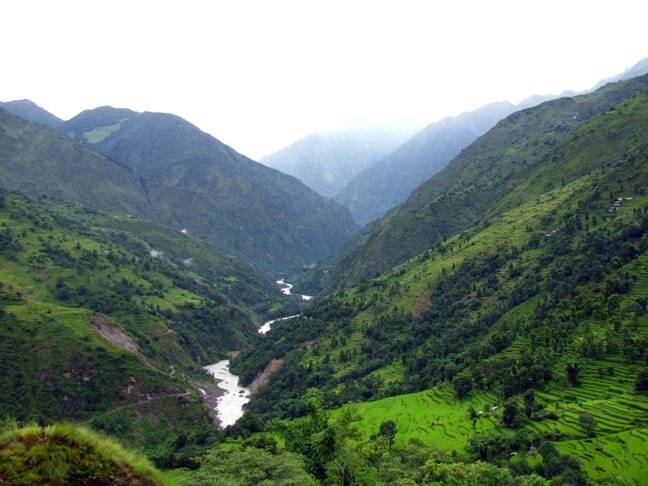 The majority of trekkers hike in this direction, but more adventurous soulss choose the opposite approach. October, November, April and May are the best months to hike the Annapurna Circuit. The trail is more crowded during this time, but if you get an early start finding accommodations shouldn’t be a problem. While it’s possible to trek in other months (we went in September), you must be prepared for extreme weather and dangerous trail conditions. Most trekkers will plan their logistics from Pokhara or Kathmandu. While there, be sure to get an ACA (Annapurna Conservation Area) Trekking Permit and a TIMS (Tourism Information Management System) Card, as they are required for the Annapurna Circuit trek. Transportation to the start of the circuit and porters can be arranged from Pokhara or Kathmandu. However, you don’t need a porter if you pack wisely: Guest houses and restaurants line the entire circuit, so carrying camping gear and food is not required if you stick to the main route. Most trekkers start the route with a tentative itinerary and figure things out as they go. You’ll want to leave some flexibility in your schedule for acclimatization, weather, and fatigue. The following chart details the Annapurna Circuit, with distances, elevations, lodging options and what we did as a general itinerary. Be sure to give yourself time to acclimatize for a couple days in Manang. There are plenty of accommodations and day hikes to enjoy there while you’re getting used to the altitude. From Besisahar, many people chose to take another bus to Khudi to officially start the trek, and some continue up the trail in Jeeps. The first part of the trek meanders along the Marsyangdi River, where you’ll cross several rickety bridges and rice paddies. The terrain is warm and lush, so keep your eyes peeled for leeches. As you gain elevation, the terrain will slowly change, the air will become thin and dry, and you’ll notice mountain peaks off in the distance, with signs of Tibetan life including prayer wheels, flags and carved stones. Pink buckwheat fields line the lower hill sides. As you make your way over Thorung Pass, the black lunar landscape crumbles beneath your feet and the sharp wind stings your face. After you take a picture in front of the Thorung Pass sign, you’ll quickly descend down the steep sharp volcanic rocks that lay on the other side. The terrain there is much more dry, rocky and dusty. 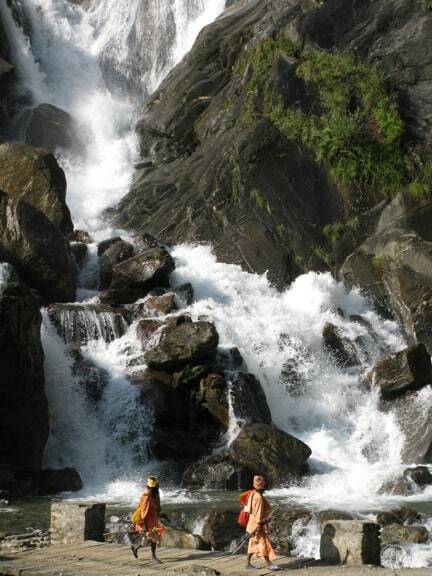 You’ll move fast on your descent until you reach the hot springs in Tatopani. The terrain will become warm and lush again, which your skin will gladly welcome. From Tatopani, you’ll ascend another 6,562 feet (2,000m) up to Poonhill, which offers arguably the world’s best sunrise. Thereafter it’s all downhill, including over 3,000 dizzying stone steps. Make sure you have good footing, as falling on those stones is not fun. 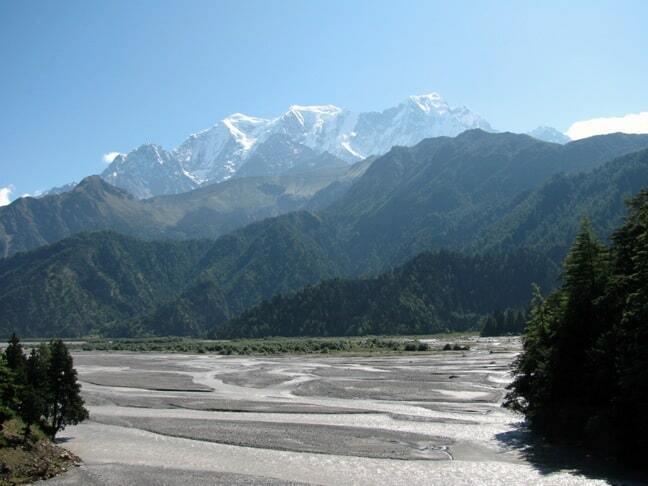 The Annapurna Circuit trek easily ranks among the world’s best hiking trails. But it’s quickly changing with the ever-increasing demand of tourists. Over the years, more and more tourists have been traveling to Nepal and trying to cut the Annapurna circuit short. To meet their growing demands, roads have been built at the beginning and end of the hike, and are continually being developed. I believe that these roads will eventually cover the entire route. 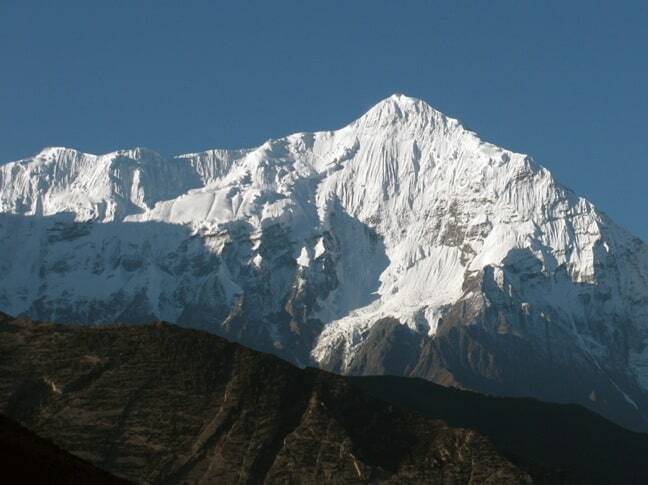 The most notable evidence of this comes shortly after crossing the Thorung Pas, in the town of Jomsom. The trail has developed into a road, where people can take jeeps all the way to the end of the circuit. While this “progress” might not seem all that terrible, it is for trekkers who want to experience the full beauty and terrain of the Annapurna Circuit on foot. Imagine some of the most beautiful terrain in the world, spoiled by the constant flow of tourist-filled jeeps honking, whizzing by, and kicking up rocks and dust in their wake. This puts trekkers in a horrible position. The question will unavoidably arise: “Do I continue to deal with the jeeps, or should I simply jump in one?” I have to admit, there were a few times when even I almost cracked. Does this mean the trek will be destroyed forever? Who knows? 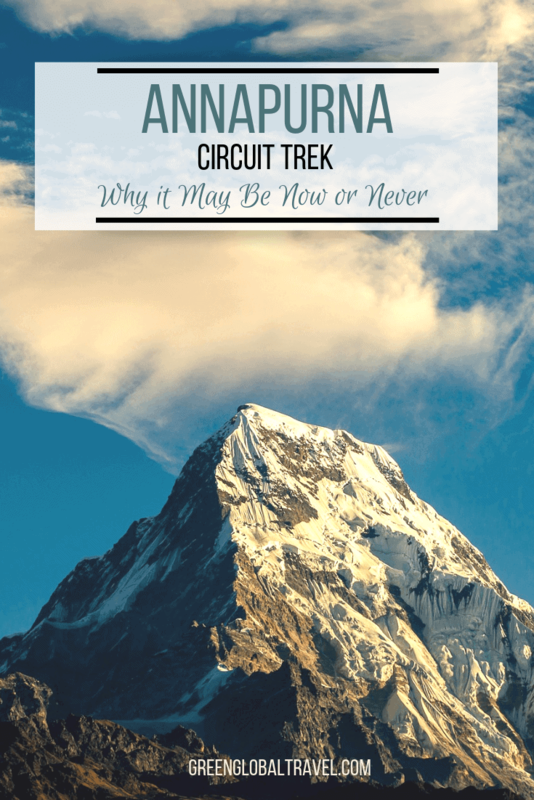 However, for now there seems to be an equal demand among those wanting a shorter trek and those wanting a longer trek, and the Nepalese realize there is an opportunity to meet both parties’ needs.